Missing teeth or teeth that are beyond saving can be replaced with natural-looking, fully functional new teeth that are permanently fixed in just one day. Our doctors can place as few as four implants in your arch to support a full set of new teeth that are securely fixed-in and provide close to full, natural chewing power. Known as the New Teeth in One Day procedure, this cutting-edge treatment makes it possible for most patients to receive dental implants and fixed-in new teeth without the need for bone grafting. This includes patients with severe bone loss who were ineligible for implants in the past. Your new teeth will be completely stable, will look and feel totally lifelike and will not slip or irritate your gums. 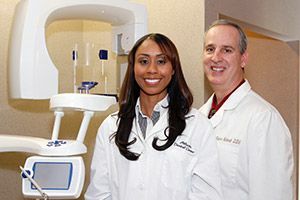 Dr. Lee and Dr. Schmidt are specially trained to deliver the New Teeth in One Day procedure. 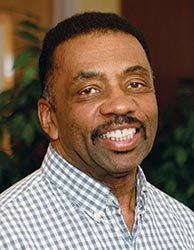 Dr. Schmidt and Dr. Lee are both very experienced and skilled in dental implant placement, as well as the design and placing of top quality replacement teeth. Dr. Lee has earned a fellowship with the International Academy of Dental Implantology and Dr. Schmidt has earned a fellowship with the International Dental Implant Association. Both organizations are dedicated to delivering state-of-the-art training in implant dentistry. Our doctors are also members of the American Academy of Cosmetic Dentistry. They use their advanced skills to create new teeth that are beautiful, look completely natural and fit perfectly. 1. 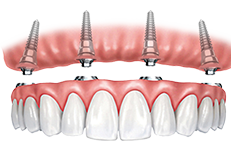 The implants are angled and placed in a way that provides maximum stability and support for the new teeth. 2. 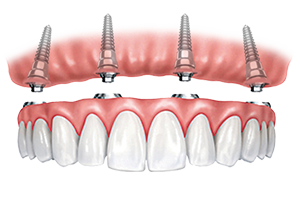 The new teeth are securely screwed onto the implants, preventing any issues with shifting or slippage. 3. The replacement teeth are fixed in place and will look, feel and act just like natural teeth. The breakthrough New Teeth in One Day procedure involves placing four to six specially designed implants in strategic positions on your arch where the bone is of the highest volume and density. 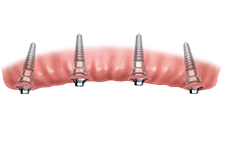 The implant placement will provide the strongest support for your implants and teeth. This includes placing the rear implants at an angle to utilize the densest bone in the jaw. 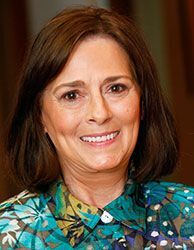 This procedure eliminates the need for bone grafting in the vast majority of cases and includes people with severe bone loss who were not eligible for implants prior to the New Teeth in One Day technology. Since bone grafting is eliminated in most cases, getting permanently fixed-in teeth is faster, more efficient and more affordable than ever before. After initial diagnosis and preparation appointments, the doctor will perform the entire procedure in the same day. This will include any needed extractions, placing all your implants and providing you with an immediate, functional and aesthetic set of fixed-in teeth. In a couple of months, when the implants have fully healed, the doctors will place the final new teeth. They will feel and function very much like real teeth and will have a beautiful, natural look. Our New Teeth in One Day procedure requires meticulous planning and careful execution. Our advanced technology and attention to detail makes the entire process efficient, accurate and minimally invasive. 3D X-rays from the CT scanner are used to find the greatest density of jawbone for implants. 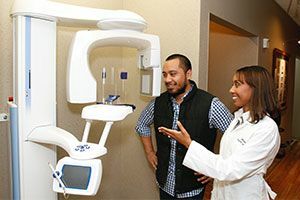 We take full digital X-rays and use our Cone Beam 3D CT scanner to capture 3D, 360-degree digital views of your teeth, jaw and surrounding anatomy. The doctors use these images to determine where the bone volume and density is sufficient to support your implants. 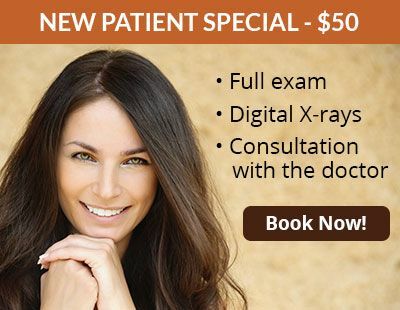 The doctor will explain the procedure in detail and answer any questions so you are completely informed about what to expect before, during and after the procedure. 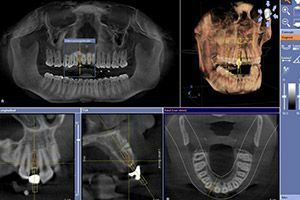 3D implant planning software is used to precisely map out the entire procedure before beginning any treatment. Our doctors transfer your CT scan images into special 3D implant planning software. They use this information to precisely map out the exact position, angle and depth of insertion for each implant. To ensure complete accuracy, our doctors create a surgical guide that is positioned over the jawbone to aid in implant placement. The guide marks exactly where and at what angle each implant is to be placed. Use of a guide also removes the need for unnecessary cutting and suturing, making the procedure minimally invasive with the least amount of post-treatment discomfort. Our doctors ensure your treatment is gentle and comfortable. Our doctors use high-tech instrumentation and gentle procedures for extractions which cause little to no trauma or damage to the surrounding tissues. This makes the procedure efficient and essentially painless. Our doctors prepare your treatment room in order to meet surgical sterility requirements. This is a far higher standard of practice than used in most dental offices. The doctors also make sure you are comfortable at all times. This includes injections that are virtually unnoticeable. To help your implants heal quickly, our doctors centrifuge a small amount of your own blood to extract a plasma rich in growth factors (proteins). This plasma mixture is then applied to your treated tissues. In addition to speeding up healing, these growth factors prevent infection and reduce postoperative swelling. 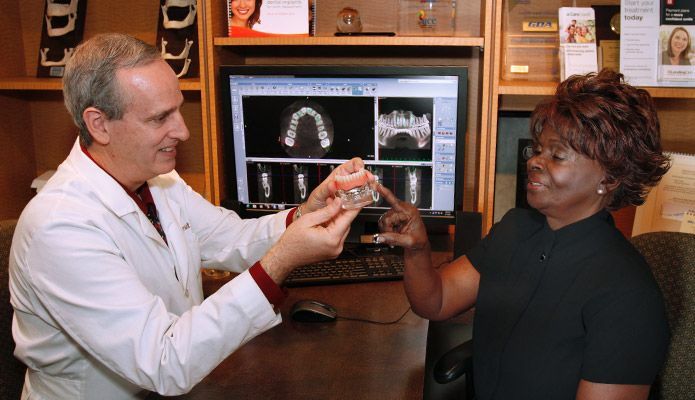 Our doctors use a special electronic measuring device to determine implant stability. When the readings show that your implants are fully stable, the doctors will provide you with your final new teeth. 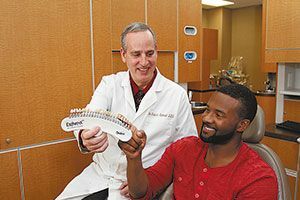 This helps ensure long-term success of the implants. You will receive high-quality new teeth on the same day. You will receive your new temporary teeth on the same day. 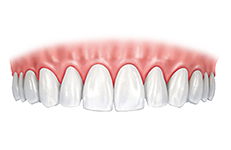 These are high-grade, custom acrylic, fixed-in dentures that are immediately functional. 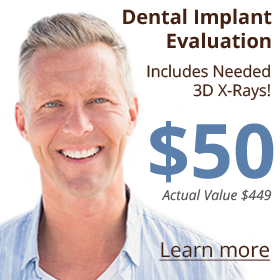 Once the implants have fully healed, your final teeth are placed. Our doctors work with a master lab technician to ensure that your new dentures have the correct fit and optimum aesthetics. The lab tech uses acrylic that has been processed under extreme pressure, so your final teeth will be very sturdy and will hold up longer than average. Your final new teeth will have the look and feel of natural teeth and will provide close to full natural chewing power. Unlike traditional dentures, fixed-in dentures have no false palate on the upper teeth to inhibit your sense of taste and make it harder to enjoy food. Eating will be very easy and pleasurable. After the new teeth are placed, you will smile again with confidence!